The Ace of Swords is loosely based on the Eagle Nebula, as swords are an air suit, with a comet for the sword itself. I tried to tie in some of the original card’s symbolism, such as a ‘crown’ around the tip of the blade and the bright comet (the sword) breaking through the murkiness of the dark, symbolizing that moment of discovered intellect. Do not let emotions cloud the issue, but instead rely upon cold, hard facts. Analyze the situation carefully, think things through and get right to the heart of the matter. Allow yourself the chance to reach your “eureka” moment – the lightbulb that chases away the shadows and lets you see clearly, guiding you effortlessly into a new way of seeing things, and knowing what you need to do. 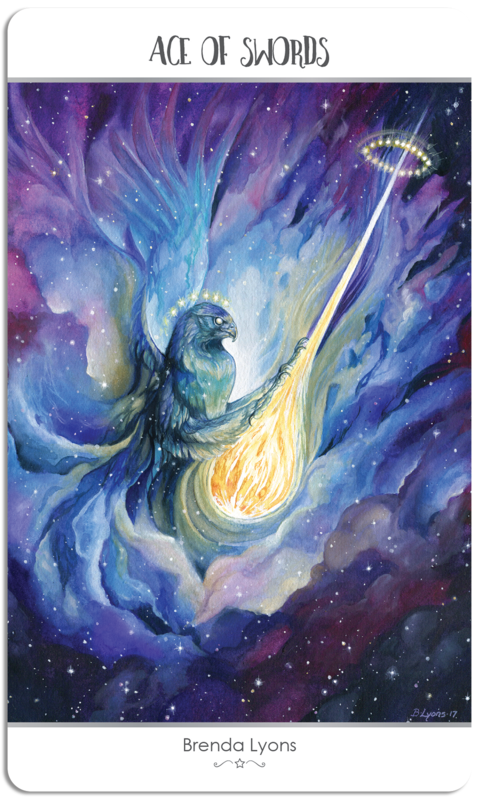 This entry was posted in Artist, Deck Review, Featured Card of the Day, General Tarot, Readings and tagged 78 Tarot, Ace of Swords, Astral, Tarot.